This post has already been read 11412 times! Human rights watch, has revealed that at least 321 civilians were killed by the Lord’s Resistance Army (LRA) in the Democratic Republic of Congo (DRC) in a previously unreported massacre in late 2009. New York-based Rights Watch has added that at least 250 people were abducted by the rebels, including at least 80 children during the killing spree in the Makombo area of northeastern Congo. According to international press, Senior Africa researcher Anneke Van Woudenberg called the massacre “one of the worst ever committed by the LRA in its bloody 23-year history”. Yet the massacre targeting at least 10 villages, which occurred from December 14th to December 17th, 2009, went unreported for months because of the remoteness of the area. Col. Felix Kulayigye wondered whether the Congo army would not have got wind of LRA activities within those four days and gone to rescue its people. He said the UPDF intelligence indicates that the LRA has less than 200 fighters who have no capacity to kill with impunity. The LRA is a Ugandan rebel movement that was pushed out of Uganda and is now in a tropical forest straddling the border between Congo and the Central African Republic. The LRA, which was founded in Uganda in 1987, says it wants to create a theocratic state based on the Biblical Ten Commandments. A protracted operation code-named Lighting Thunder launched in December 2008 by the Ugandan army failed to kill or capture Kony. He fled within minutes of UPDF recahing his camp in Garamba, Eastern DRC. 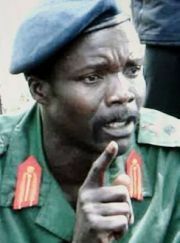 Ugandan President, Yoweri Museveni, recently claimed LRA leader, Joseph Kony, is harboured in Darfur region of Sudan, adding that there were no more threats from his torn up rebel army.